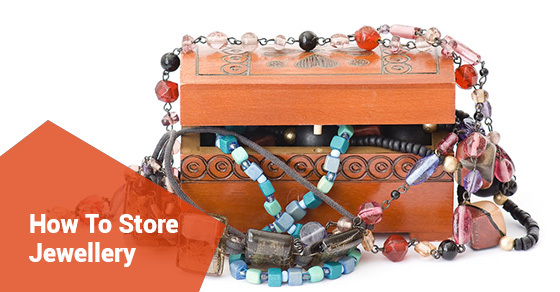 While collecting jewellery can be fun and pleasurable, storing it and keeping it organized is often a headache. Over the course of a lifetime, or even just a couple of decades, the amount of jewellery we accumulate can add up to a tangled mess. If you are finding that your jewellery is quickly eating up valuable storage space, and that you just don’t know how to organize your jewellery conveniently, below are four jewellery storage hacks to help you out. It is always recommended that you store necklaces individually, so they don’t become tangled. Peg racks mounted to walls or doors are a great storage option for necklaces. Freestanding holders with individual places for each necklace are also popular options. If you are thinking about putting your necklaces in a storage facility, you can wrap each necklace individually before putting them away. Because they don’t fold or become tangled as readily as necklaces, bracelets and bangles can be stored in drawers or trays, and you don’t have to worry about a huge bird’s nest every time you open up a jewellery chest. If you are utilizing a self storage facility to store some of your bracelets or bangles, you can keep them in a secure jewellery chest, or even a simple rack of plastic drawers from your local hardware or home and garden store. Earrings, like necklaces, are best stored individually. You can either store them on hooks, or in drawer organizers that are compartmentalized to handle each individual set of earrings. A cork board or metal screen is also a good way to store earrings. Simply hang the earrings in pairs by inserting them in the cork or in the little holes of the screen. Always remember that if you are putting jewellery into self storage, you are giving up your own personal vigilance over your belongings, so make sure the storage facility you are doing business with prioritizes the security and safety of your belongings. You might also want to look into an insurance policy if you are storing a lot of value in a single place. Storing jewellery that you don’t use on a regular basis is a great way to declutter, and to make room for the things that you wear most often. Make sure your jewellery is stored properly and safely by keeping the above jewellery storage strategies in mind.